Some customers have problems in starting magneto based Powerdynamo systems as kickstarter revolutions are too low to reliably start the system. To help this, many systems may be converted to a battery based system start already from about 150 revs/min onwards, rather than the 320 needed by magneto systems. 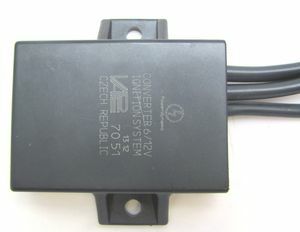 The modifications needed differ depending on whether the system has internal or external pickup. Unfortunately not possible is to modify internal trigger systems with advance unit. 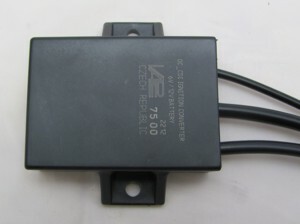 In all cases a converter is used to convert battery voltage 6 or 12V to the needed condenser charge of about 360 volts. There are various types of converter, depending on use. Please do not confuse the converter with the advance unit, even though they have the same housing - they are totally different parts. Such systems become, though there still is the magneto, battery ignitions. Advantage is lower starting revolutions. 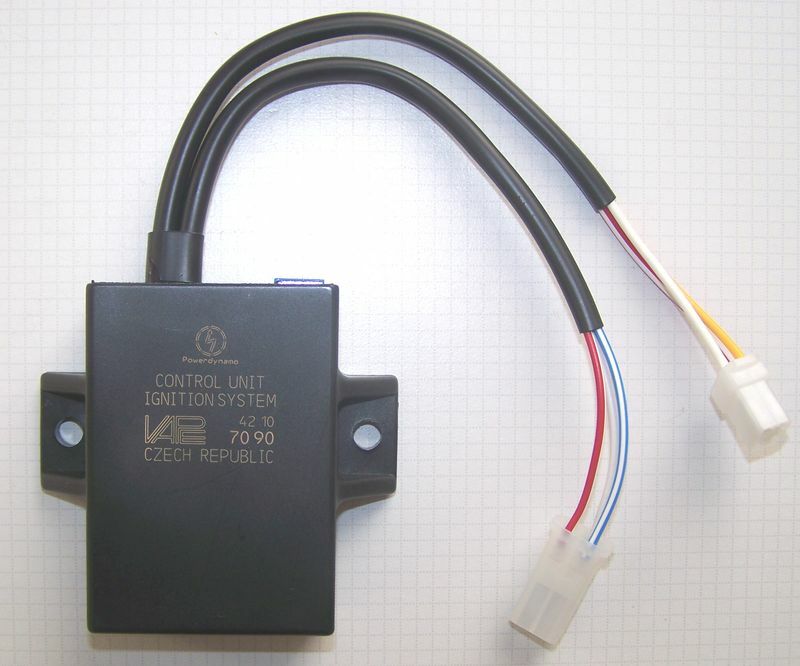 Ther condenser discharge ignition housed in our ignition coils is charged by a converter which converts battery voltage to 340 volts. The magneto side of the ignition will be deactivated by grounding the red wire. NOTE: Never connect this red wire to somewhere else than ground! 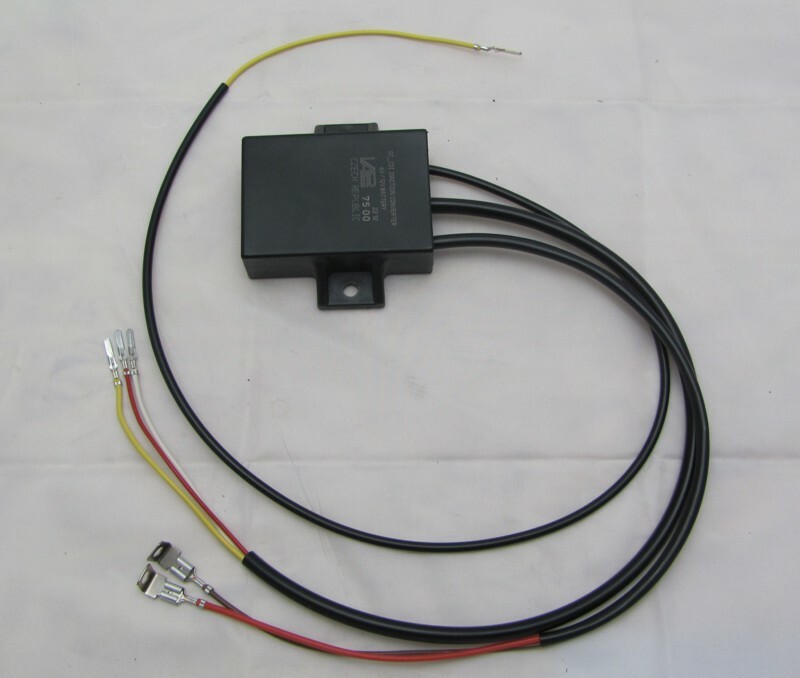 The converter converts battery voltage to ac voltage of 340 Volts to charge the condenser in the ignition. Depending on revolutions and with it amount of sparks the converter takes about 10 to 15 Watts (as any normal ignition coil also would). The red wire of the converter ... ... is the wire feeding it with battery voltage. It will be connected to the main switch. The white wire of the converter ... ... connects to ground (negative ground!). The yellow wire of the converter ... connects to the yellow wire of the sensor. Finally - before connecting the battery and the first kick - please carefully check all wiring and fastening. From the converter run 3 wire bundles (this distinguishes the box from the advance unit having same housing. The wires with the free ends: connect the white to negative ground (battery minus) and the red via the main switch and 5A-fuse to battery plus. the bundle with the male plug ... ... connect to the counterfitting plug at the ignition coil.. Check that you get red to red, white to white and blue/white to yellow. green/red remains unused. The bundle with the female plug ... ... connect to the counterfitting plug of the advance unit. check that you have blue/white to blue/white, white to white and green/red to red/white. (with wires yellow, white and red/white): ... connects with the wires yellow and white running from the sensor. yellow to yellow and white (which is ground) to white. the red/white remains unused. Finally and - before you connect the battery and kickstart - please cerefully recheck everything. The system works with both a 6 or a 12V battery, but never without one! 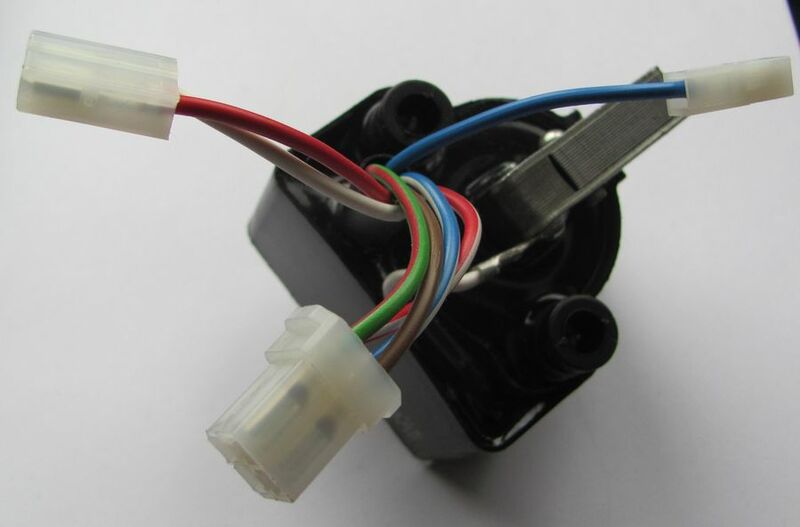 A different ignition coil (coil 7025) is used. this coil has 2 input lines, one for the magneto and one for the converter. This coil is available as twin or single coiln coil. making internal sensor systems with advance units battery powered is NOT possible!